A traditional side salad just like grandma used to make it! Growing up in Germany I was fed a loooot of traditional German food – well at that time I called it just ‘ food’. My grandma in particular stuck to only the time-honored dishes she knew and mastered. Schnitzel, kartoffelpuffer (think potato fritters or latkes), and broiled chicken. One of the side dishes I miss the most is the cucumber salad she made. It’s nothing fancy, but perfectly balanced and a great light accompaniment to a lot of heavy meals. I never had the chance to ask her how she made it, so I looked some traditional recipes and experimented till I came as close to her dish as I could. There is one thing I changed. My grandma hated onions – HATED them with a vengeance. I found out that they however work really well in this salad, so I took the liberty to add them. They add some crunch as well as some extra flavor to the salad. Sweet, acidic, salty, a bit spicy, sharp, crunchy and some depth from the dill. Simple ingredients but hitting every note on your pallet. 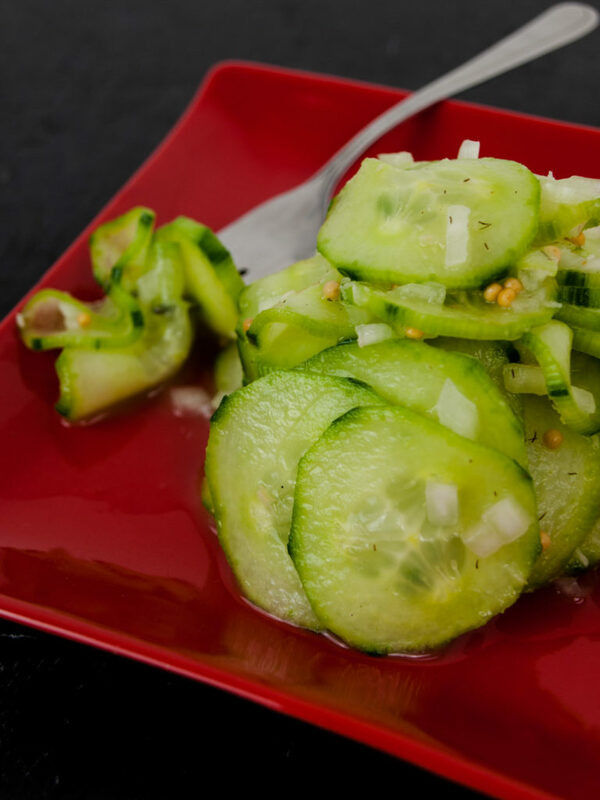 The recipe is really easy to make and takes no time at all, especially if you use a mandolin to slice the cucumber. Afterwards you need some patience though… You could eat the salad straight away, but it tastes so much better if you let it sit in the fridge for about 8 hours – even better overnight. A traditional German cucumber salad. Just like my grandma used to make! A few easy steps and some patience! Peel the cucumber and cut it into 2mm thick slices. You can use a mandolin for this. Finely dice the onion. Mix the diced onion, salt, sugar, vinegar, mustard and dill in a bowl. This is your dressing. Add the cucumber slices to the bowl and coat them thoroughly with the dressing. Cover the bowl with cling film and let sit in the fridge for 8 to 24 hours. Give it a little shake once in a while to make sure everything marinates properly. Serve your cucumber salad alongside a proper German meal*! Let me know what you think about the recipe in the comments below! Did you ever have German cucumber salad? If you are from there as well, does this taste like what you are used to as well? Let us know in the comments to make this as authentic as possible!